Convert miRNA to Large RNA in Single Library Prep. Sequencing data from our prep show over 1300 unique miRNA along with over 19,000 unique protein coding transcripts using 10ng rRNA depleted Universal Human Reference RNA. 2D Complete RNA kit converts all RNA Biotypes in the same library prep. Libraries are prepared using the 2D Complete RNA Kit and sequenced with 1x100bp reads on the Illumina Platform. LOVED BY HUMANS. LOVED BY ROBOTS. The data is from libraries prepared using the 2D Complete RNA kit with various input amounts of Human Brain mRNA. Data shows very consistent performance across 3 orders of magnitude of input range. Insets indicates Pearson coefficient of correlation. 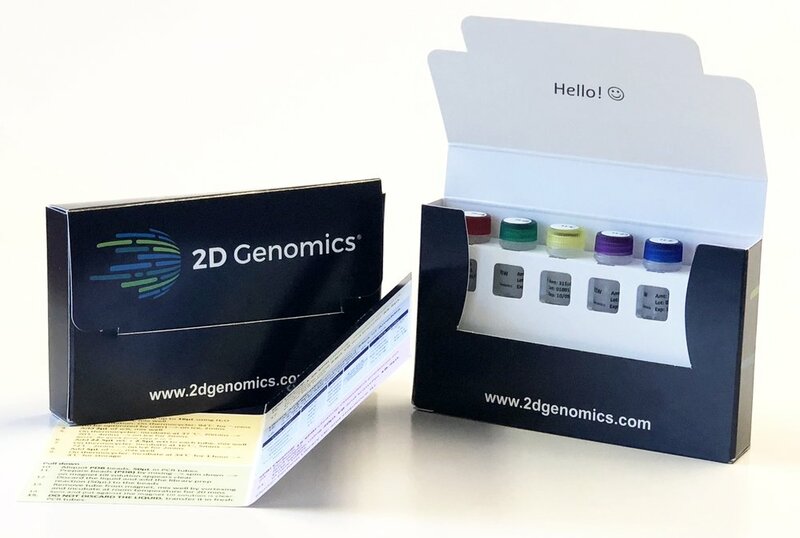 2D Genomics Library Prep kits retains > 99% strand accuracy. With 10ng Human Brain mRNA input, the library was prepared using 2D Complete RNA Kit. The data shows >99% reads correctly mapped to the originating strand of genomic DNA for PHC1 and M6PR transcripts. Uniform coverage obtained with a broad range of RNA concentrations. The traces represent coverage of the FTL transcript; rich in GC content. The transcript is difficult to cover using popular commercial kits. 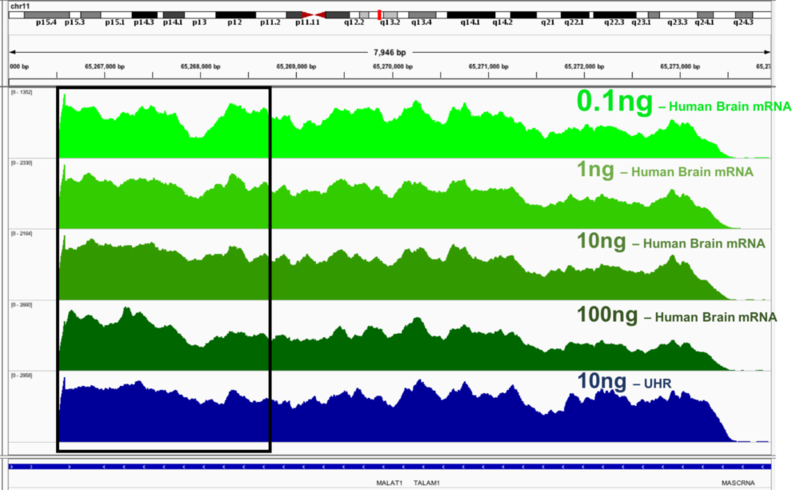 Each green trace represents a different amount of sample inputs, from the top 0.1ng, 1ng, 10ng and 100ng of Human Brain mRNA. The bottom trace (blue) was generated with 10ng of UHR RNA, which was Ribo-depleted. Improved detection and uniform coverage obtained with broad range of RNA concentrations of Low- abundance transcript MALAT1. This transcript is difficult to cover using other commercial kits. The green traces represent different amount of sample inputs, from the top 0.1ng, 1ng, 10ng and 100ng of Human Brain mRNA. The bottom trace (blue) was generated with 10ng of UHR RNA which was Ribo-depleted. Using 2D Complete RNA kit, library was prepared for cell-free RNA (cfRNA) and sequenced on Illumina Platform. The cfRNA was extracted from 5mL of Blood using Zymo Quick-cfRNA Serum & Plasma kit. The data shows conversion of All biotypes of RNA from sample type where the RNA is naturally degraded.